Does Your Door Do This? If not, set an appointment with our garage door repair experts. Soulard Garage Door and Fence offers the highest standard of customer satisfaction and value while providing garage door repair throughout the St Louis area. From garage door installation to fencing services, gate system repair to affordable entry doors, our services are completed using authentic craftsmanship and quality parts at the best value. 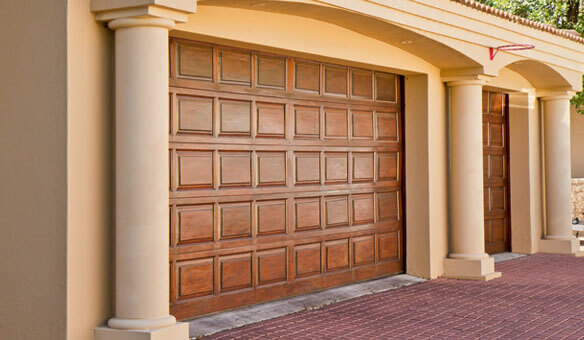 The Soulard Garage Door team is highly skilled and has extensive experience in repairing and replacing all types, brands, and models of garage doors and parts. When you're in need of garage door repair in St Louis, allow Soulard Garage Door and Fence to show you why we're highly suggested by Google, the Better Business Bureau (BBB) and Angie’s List! Allow our staff to help you find a garage door or gate system that incorporates your personal style while complementing your space. Once we find the perfect door or gate for your St Louis property, our team of seasoned technicians will quickly and efficiently install it! Malfunctioning garage doors, fencing, and gates can hinder your schedule, that's why our fast response team is ready to repair 24/7! Our mission at Soulard Garage Door and Fence is simple; honesty, transparency, quality, and value. Our company was started by two friends that set out to provide customers the personal service that the big box stores just can't offer! We work hard to keep our costs down so we can pass the savings on to our customers. Let us prove to you that local St Louis garage door repair is the best value for your money! Soulard Garage Door is more than just a repair company! Not only do we specialize in repairing garage doors throughout St Louis, we are also known for a full range of other services including door installation, fencing, and gate repair, alongside a selection of beautiful entry doors and Amarr garage doors that enhance the visual appeal and property value of your home. Here at Soulard Garage Door, we pride ourselves on providing the absolute best services while keeping our prices low. We base our work ethic off of our founding values: experience, customer satisfaction, and integrity. To prove our commitment, we provide St Louis area customers with a 90-day labor warranty on all of our services, a 3-year spring warranty, and a 1-year labor warranty. Our Amarr garage doors include limited lifetime section warranties. The Soulard Garage Door team also specializes in installing, maintaining, and repairing a complete range of metal and vinyl fencing and gate systems including Master Halco® fencing. You can learn more by visiting our fence services page! Get started on fence or gate maintenance, installation, or repairs by calling us at (314) 281-6989 or booking an appointment online today! We make it easy! Soulard Garage Door and Fence is a one-stop shop for all of your St Louis garage door, entry door, fencing, and gate repair, replacement, and maintenance needs! Check out our appointment availability, find a time and date that work best for you, and book online with us! With services from Soulard Garage Door and Fence, you can trust that your St Louis door, gate, or fence will be repaired, installed, and maintained the right way the first time. We take pride in our work and offer unbeatable warranties on all of our American-made labor and materials. Not only is the Soulard Garage Door team expertly trained, we also provide personalized service experiences for just a fraction of what larger companies charge. To view our service openings, visit our appointments page and book online! "It was a pleasant experience. I would highly recommend them and the door is top quality and beautiful. The response and expertise was so refreshing in this day of sales pressure...we are very happy"